Those who base everything they know on the past are in danger of missing the evolution happening in front of them. All that’s left now for the “jump-shooting team!” crowd is to point out that Golden State needed perhaps the greatest jump-shooter in league history to break some historical precedent that had really already been broken. Hey, no kidding. Michael Jordan and Kobe Bryant are among the greatest driver-shooters ever. Shaquille O’Neal and Tim Duncan are two of the best post players ever. Having someone historically great at something is the baseline for winning four playoff series against the best basketball teams in the world. Stephen Curry has done nothing short of revolutionize what is possible in basketball. It is hard to believe that only three years ago his ankle problems were so bad, it was unclear if Curry could even hold down a steady NBA career. 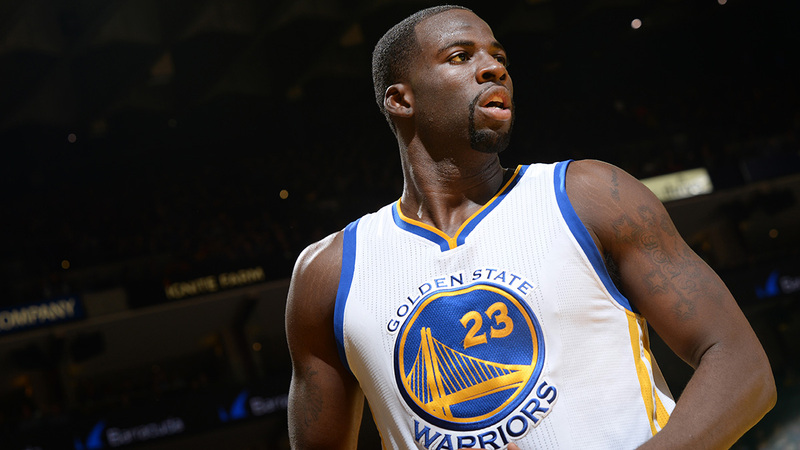 “There was doubt that crept in,” says Bob Myers, the team’s GM. “What was happening was unusual. There were a lot of scary moments.” Teams would occasionally make trade pitches for Curry, vultures circling a broken player, and the Warriors had to at least think about those proposals. That’s how bad it was. “Everyone was freaking out,” says Kirk Lacob, the Warriors’ assistant general manager. “But they were just recurring sprains. It’s not like he tore everything in there.” The Warriors held their faith in Curry’s shooting, and in his work ethic. There is no NBA defense that can contain Curry because there has never been a player like Curry. His gravity — his ability to draw two panicked defenders almost no matter where he is on the court — is the basis for everything Golden State does offensively. 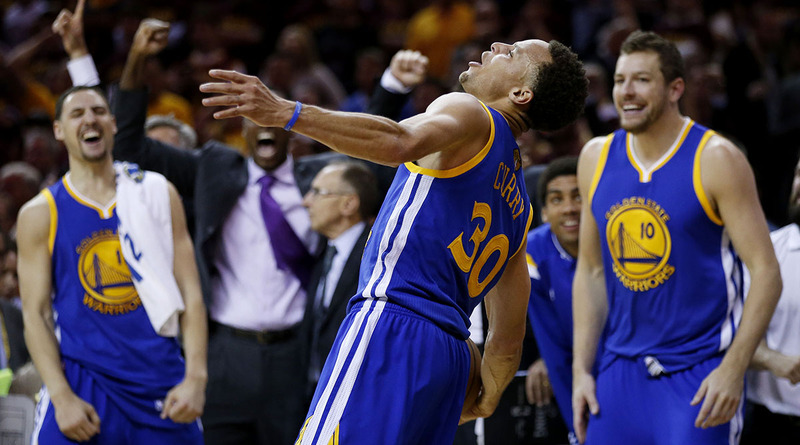 But Golden State’s embrace of the 3-point shot goes well beyond one transcendent player. Its most potent lineups, the ones that won it the title, dot the floor with at least four 3-point shooters — and five guys capable of making plays off the dribble. When everyone is a threat from 25 feet away, defenses stretch themselves thin across a huge chunk of territory. It’s hard for five guys to maintain integrity when they are so far from each other; the string eventually breaks, and when it does, Golden State can produce all kinds of looks — drive-and-kick 3s and jaunts to the rim ahead of scrambling defenders. The right combination of speed and shooting can beat size. Golden State used speed to leverage the rules on defense, too. When the NBA lifted the old illegal defense rules, it freed players to roam almost anywhere they wanted. You could ignore non-shooters to put out fires somewhere else, knowing that if your guy suddenly came open, a teammate would rush to your aid. The Warriors’ small-ball lineups had a short vertical reach, but they were the league’s best defense on the horizontal plane. They were everywhere, denying entry to the post, clogging up passing lanes, swiping for steals at exactly the right moment. They sometimes moved more fluidly on defense than on offense. Golden State is not easy to imitate. It may not be leading a revolution that will sweep the league next season, or even five seasons from now. It has unique players that make a unique system possible on both ends. But that’s the point: It has expanded the definition of what is possible, building on teams and coaching philosophies that came before. The NBA is always changing. A team at the forefront of those changes just happened to win the championship. Iguodala became that sort of player for the Nuggets, and in the summer of 2013, after Golden State shot Denver from the first round, he told the Warriors he wanted to meet with them about his free agency. Lacob prepared a promotional DVD showing Iguodala in a Golden State uniform, but as he went to slide it into the DVD player, Iguodala waved his hand, Lacob remembers. He didn’t want to see it. He was simply there to say he wanted to play for Golden State, and that he would wait for the team to clear cap space. As Myers worked the phones for nearly three straight nights and days, searching for a dumping ground, team owner Joe Lacob retreated to his vacation home in Montana. When he was there, Lacob had a habit of leaving his phone behind, or wandering into areas where he had no reception. Myers told Kirk Lacob to accompany his father and plant himself in a spot with good reception; he would need ownership approval for any deal, and he might not have time to wait. Kirk Lacob spent most of three days sitting on a patio. Finally, his phone rang. It was Myers, panicked. He couldn’t reach Joe Lacob. Kirk didn’t know exactly where his father was. Myers had a deal with the Jazz, but they were squeezing him. He couldn’t get any protection on the two first-round picks they were demanding, and they asked him to toss in another two second-rounders. Worse yet: They wanted cash — all $3 million the Warriors were allowed to include in a deal. That was Joe Lacob’s money, and Myers needed to know if he could spend it without getting himself fired. Kirk Lacob told him to go ahead: “I don’t know where my Dad is,” Lacob told Myers, “but he told me to get the deal done, so if it takes cash, throw in everything we have.” Myers asked if he was sure. 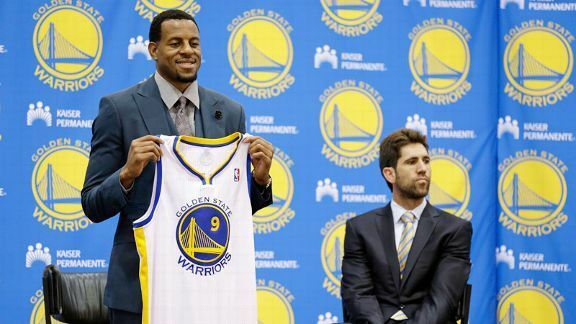 Lacob was, and Iguodala became a Warrior. The Philadelphia frustration lingered in Golden State, even as Iguodala was in the perfect spot to fulfill his glue-guy destiny. His jumper came and went, his knees hurt, and Steve Kerr demoted him to the bench: four draft picks and $11 million for a reserve. But Iguodala bought in, and in the team’s most pressurized moment, he saved the season. 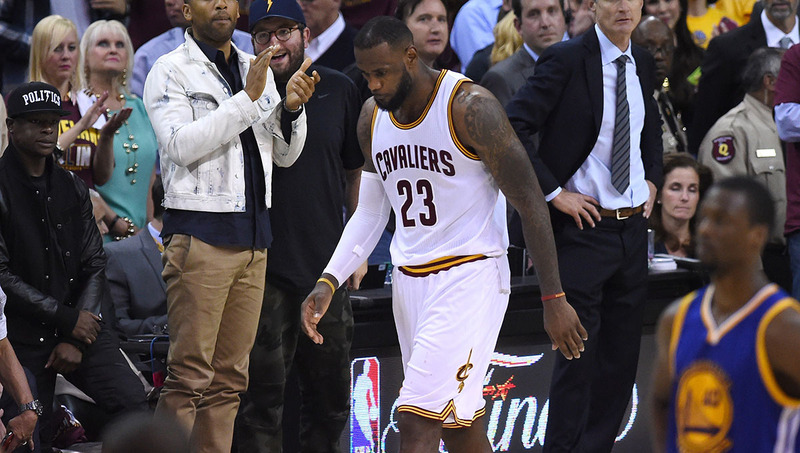 Golden State had no one else who could contain LeBron James; Kerr called timeouts to rush Iguodala back into the game on LeBron’s tail, and finally started him in Game 4. In the 48 hours before Game 6, Iguodala took on a more vocal role than anyone could remember, team officials say. He talked to players about the urgency of this moment — the importance of winning Game 6 and avoiding the terror of a rested James in one winner-take-all game. Iguodala repeated the word “six” so often, team officials say, that it almost seemed as if he were trying to nestle it into each player’s brain as some sort of internal mantra. Meanwhile, with their season on the line, the Cavaliers stuck Timofey Mozgov on Iguodala and conceded open shots. They would live and die with Iguodala’s offense. They died. It was the crowning achievement of Iguodala’s basketball life — the backroom artisan doing such spectacular work that no one had any choice but to thrust him into the spotlight. Tempers ran high during a physical Golden State practice in Portland in the preseason of 2012 when a rookie, some loudmouthed second-round pick, spoke up. Draymond Green told his teammates that if they wanted to bring out the best in each other, if they wanted to amount to something larger than the sum of their parts, they would have to go at each other in practice — hard. It was never personal, Green told them. It was part of the process. You know Green’s story by now. He carved out a key bench role under Mark Jackson, and Kerr expected him to remain a reserve; as he mapped out his rotation in July, Kerr penciled Green for just 12 measly minutes per night behind David Lee. When the team passed on Kevin Love, Myers warned Kerr he would have to play Green more, but no one expected this — especially after a disastrous training camp in which Green, chasing highlight plays he couldn’t pull off, earned the nickname “Draymond James.” Green opened up Golden State’s offense and unlocked a switch-heavy defense that stormed the league. That defense collapsed against Cleveland whenever Kerr lifted Green for a slower big man. By the end, he was one of three indispensable Golden State players, along with Curry and Iguodala. More than anyone else, Green emerged as the reason passing on Love turned out to be the right move. Thompson could shoot, but to become an All-Star, he would have to defend the best wing scorers. For an entire month in the summer after Thompson’s rookie season, he and Erman worked every day at the Warriors’ practice facility on specific defensive drills: sliding over screens, helping inside and recovering onto shooters, sliding his feet. Every Monday, Erman would prepare film clips of Thompson doing those same things in games — sometimes screwing up, sometimes nailing them. Thompson never asked for days off or complained about the workload. “He probably thought everyone was doing that over the summer,” Erman says, laughing. “He just never knew it was not something everyone did.” Thompson just showed up when the coaches told him to, in keeping with his low-key personality. 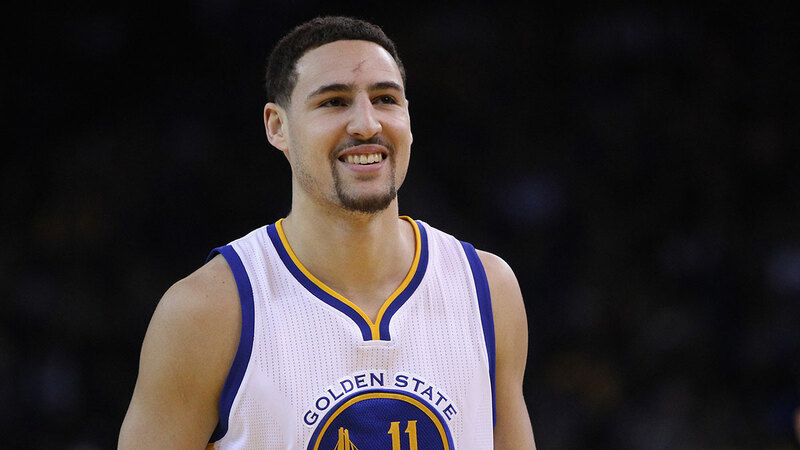 Thompson struggled during these Finals, but he developed into the two-way player the Warriors bet he could be when they refused to trade him for Love. Erman and Thompson spent much of the next offseason working on Thompson’s dribbling and paint shots. Two staff members would press Thompson full-court, and if he got to the rim, Thompson would meet Erman holding a padded dummy over his head. Thompson shot 64 percent in the restricted area this season and drew more free throws than ever. Kerr overhauled a team culture that had grown poisonous, for well-documented reasons, under Jackson and his assistants. In his zeal to motivate players, Jackson fostered resentment among them and toward the front office. He fired two assistants, requested Jerry West stay away from practices, and asked a younger front-office official to stop rebounding for players, sources have said. When Ezeli was injured last season, Jackson and his staff told the healthy players that Ezeli was cheering against them — so that he would look good, according to several team sources. Players confronted Ezeli in a meeting, and he wept at the accusation — which he denied. But firing Jackson was a risk. He instilled a defense-first mentality that was new for the franchise, he inspired players, and he freed his assistants to craft the nuts and bolts of a new defensive scheme. 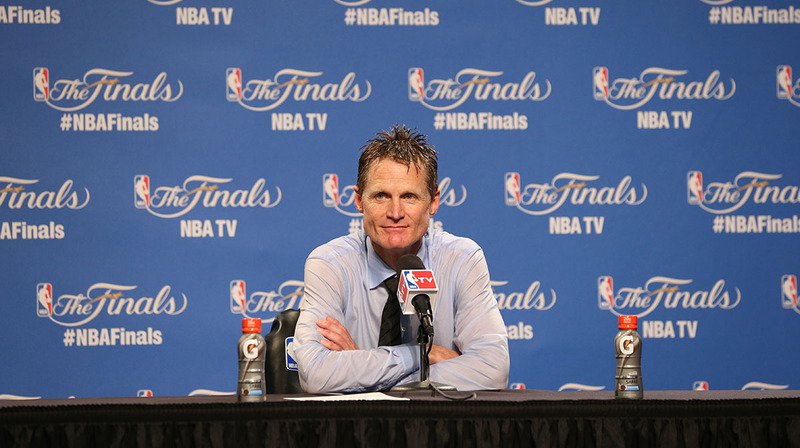 If Kerr failed, he and the team’s ownership would face fiery criticism. Kerr responded by hiring perhaps the most accomplished staff of assistants in the league and nurturing an environment of calm and fun — a place in which everyone felt comfortable exchanging ideas. Nick U’Ren, his 28-year-old lieutenant and video guru, famously suggested in a 3 a.m. text that Kerr replace Bogut with Iguodala in the starting lineup after Game 3 of the Finals. Kerr praised U’Ren publicly, and the team has since given U’Ren endless crap over his new fame, calling him “Boy Wonder” and mocking news reports focusing on his role. Kerr revamped the offense with help from Alvin Gentry, turning isolation drudgery into the league’s most pleasing ball-movement machine outside San Antonio. Lacob and Guber started the reconstruction when they purchased the team in 2010. They tore down walls in the office, spent big on new technology, and empowered smart people. The Monta Ellis–Bogut trade signaled a new commitment to defense — even if the fans hated it so much, they damn near booed Lacob off the floor during Chris Mullin’s jersey retirement ceremony. Bill Simmons tried to explain that torrent of anger in a column outlining 60 events that alienated fans during decades of misery. “Now he should write something about the 60 ways we improved the team,” Lacob says. Yep, the Warriors got lucky. They suffered no major injuries, beat teams that did, and got through the West without facing the Clippers or Spurs. Guess who else got lucky: every team to ever win the championship. Pick any playoff season — literally, any season — and you’ll find multiple injuries that tilted the championship odds. Sometimes those injuries were minor — temporary dings to a few key role players. Sometimes they were career-threatening injuries to stars. The Warriors, on balance, were luckier than most championship teams. They stood almost intact, while stars and crucial role players — from Love to Patrick Beverley — fell into the wreckage below them. That doesn’t take away from their accomplishment, and if you think it does, you’re willfully ignoring all of NBA history. No one ever needs to apologize for their road to a championship. You can only play the schedule, and gutting out 16 playoff wins is difficult, regardless of the precise path. The Warriors earned this with smart draft picks, expert coaching, all-world talent, and the necessary dash of luck. They are the 2014-15 NBA champions. Their title defense starts now.